a beautiful faux lizard skin box. the box and removes three different colored dice. two predictions which will become apparent soon. place them out of sight and thoroughly mix them up. spectator and placed on top of the box. two dice on top of the bag. placed on the box, but it also matches the prediction inside. two dice are tipped from the bag, showing a color match with the spectator's dice. 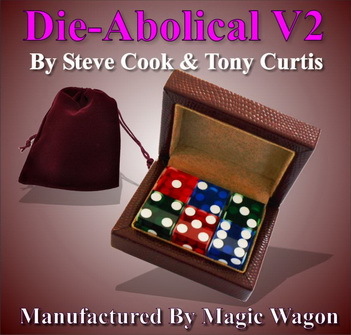 Please note that Die-Abolical V2 can be repeated with a different prediction outcome. Limited Edition Only 100 Available Worldwide. Manufactured in 2016 by Magic Wagon Thailand.